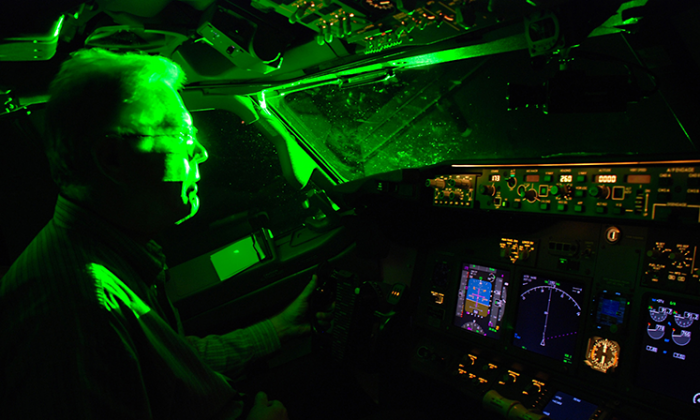 This image by the FAA shows what happens when a laser pointer is aimed at a cockpit. Pointing a laser at an aircraft poses a serious safety risk and is against the law. Ottawa has announced new measures to ban the use of handheld laser pointers within a prohibited zone in order to protect pilots from distractions and momentary blindness. The new restrictions prohibit possession of handheld laser pointers of more than 1 milliwatt outside a private location without a legitimate reason, such as work or education, within a 10-kilometre radius of airports and heliports, as well as within greater Toronto, Vancouver, and Montreal areas. The fine in violation of the new rules are $5,000 for an individual, and $25,000 for a corporation. “I take very seriously the increased risk to aviation safety and to people on the ground caused by lasers. That is why I am proceeding with these new safety measures which take effect immediately,” Garneau said in a statement. The measures announced will allow law enforcement officers to issue immediate on-the-spot fines to anybody found in possession of a laser pointer. There are existing penalties if someone is found to be intentionally shining a laser into the cockpit of a plane, with those convicted facing up to $100,00 in fines, fiver years in prison, or both. According to Health Canada, a simple handheld laser could be over a million times brighter than your average 100-watt lightbulb. Exposure to these beams can lead to blindness, or eye damage. Specifically, aiming a laser at an aircraft can cause a major incident by distracting the pilot, creating glare that affects the pilot’s vision, and temporarily blinding the pilots, which can lead to putting all the people on board the aircraft at serious risk. Shining a laser at an aircraft will distracts a pilot and interferes with his or her ability to safely land the aircraft, according to Transport Canada. Air Canada Pilots Association wrote on their website that there has been one documented case of a pilot who suffered direct laser burns to one eye and had other vision problems. The association said the flight landed safely, but the pilot was permanently blinded and therefore could not work as a pilot anymore. In 2017, 379 reports of laser attacks in Canadian airspace were reported, according to Transport Canada. This year, 63 laser attacks were reported from Jan. 1 to April 30. Due to the high number of laser attack cases, Garneau initiated the public education campaign in 2016, and since then, the number of laser attacks on aircrafts has dropped by 25 percent. Garneau notes that he doesn’t want it to just lessen, but to disappear entirely, to where there are no attacks at all, according to a report by CBC. “It’s still too many. We want it to be zero. The education is working, but it’s not working fast enough,” Garneau said.